Wes Anderson’s idiosyncratic fixation with familial affairs, often set to a twinkling fairy tale soundtrack and pastel colours comes into its own in his 2012 Moonrise Kingdom. Right down to Disney’s Snow White each and every film we’re exposed to highlights an innate human concern with how life, and by association, our lives are portrayed and interprreted on film. Themes of adulthood dominate the airwaves whether subtly layered between comedic mirage or served up on a silver platter. It’s only natural, films just wouldn’t work without this psychological connection so Anderson’s subtle decision to deliver adult themes using children differs from the conventional norms. Some of you will be screaming, “Well what about the clearly defined, and revered sub-genre of ‘Coming of Age’ films?” To that I answer simply, this is not a coming of age film. Sam Shakusky and Suzy Bishop are not on a journey of self-discovery, their responsibilities and goals are clearly defined in their utter infatuation and intrigue in each other. Children are at the centre of this peculiar locality on the fictional island of New Penzance. Set in 1965 we open in the family home of the Bishop’s. Adorned with kooky props, quirky nooks and crannies, creaky floor boards, and the crackle of a retro record player Anderson makes his presence known with smart cinematography that emphasises Suzy’s role in the story. Introducing Suzy’s dominant Binoculars Anderson smartly frames her story about a search for something beyond these walls, the search for Sam Shakusky. But Suzy isn’t the only one. Cut to Bob Balaban, a peculiar blend of narrator in the form of cartographer and meteorologist and we have an ‘all-knowing’ physical narrator blurring the lines between diegesis and mimesis in a way only Anderson could achieve. With amusing cinematography and distinguished sartorial style our narrator sets the scene with a brief background on the island’s natural features, ending with an abrupt warning of a coming storm. Utilised to break up each informal ‘Act’ this clever narration works wonders for the smooth prgression of the story. Existing simultaneously in and out of time and space, as we come to see later, this all-knowing narrator poses an interesting plot device chosen by Anderson but it works effortlessly, giving the viewer a focus point early on and recognisable voice of reason in an otherwise chaotic hunt for Suzy and Sam. After “flying the coup” from his Khaki Scout Camp ‘Ivanhoe’ and well-meaning if incompetent Scout Master Ward, Randy Ward, played by Edward Norton the search for the elusive Sam Shakusky begins. Revealed that Sam is an orphan and has struggled to make friends all his life we’re encouraged to feel sympathy for the boy. But when we’re finally introduced to one of Anderson’s most intriguing characters we soon learn that his competent camping skills and adult attitude hold no reservations for sympathy. Never once spouting an utterance of self-pity Sam possesses an incredibly adept maturity and understanding of life while at the same time harnessing his inner, if quelled, childhood dreams forced out of him during his foster years. With such strong performances from Jared Gilman, Sam, and if slightly chilling from Kara Hayward, Suzy, Anderson’s usual character actors are forced to take a step back and allow the children to shine at the crux of the show with immaculate luster. Anderson’s sleight of hand in navigating the notion of a child’s dream and unlimited optimism finds solitude in an honest, all too brief scene involving Suzy reading to Sam and the other scouts. In this moment Suzy embodies Wendy, honorary mother to Peter Pan’s lost boys and provides one of the more sobering moments of an otherwise comedic play of wit and irreverence. Juxtaposed against Sam and Suzy’s unnerving adulthood, the use of Peter Pan imagery to compare the two states of mind marks one of Anderson’s career masterstrokes. Countering Peter Pan’s fear of growing up we have Sam’s passionate rise of maturity. 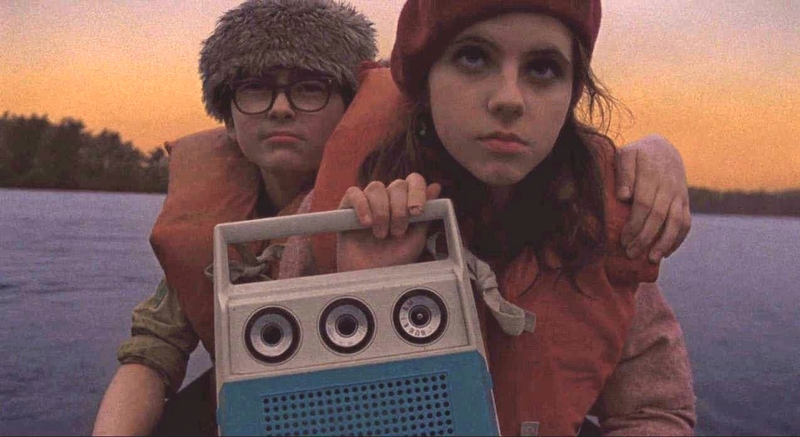 Much like Benjamin Britten’s ‘Young Person’s Guide to the Orchestra’ that opens the film on Lionel’s quaint portable record player Moonrise Kingdom plays out like a progression of components all coming together to form one piece of celluloid magic. Each orchestral section plays out individually as does each ‘Act’ of the film, forming a sleek continuity that flows throughout. I first sat down to watch Moonrise Kingdom due to the upcoming Blind Spot Series this month, The Grand Budapest Hotel. Having seen Rushmore, The Royal Tenenbaums, and The Life Aquatic with Steve Zissou I was under no illusions as to my fondness of Wes Anderson’s work and Moonrise Kingdom has certainly solidified that passion. I understand why Wes Anderson’s work doesn’t appeal to everyone, his quirky, ultra-detailed sets and vivid characters take a step away from the norm but this should be no reason to shun his visionary prowess and originality. Moonrise Kingdom is a Brilliant example of Anderson’s unorthodox idiosyncrasy that should be embraced and cherished as a marvel of consumable filmmaking. I think Moonrise Kingdom is my favorite of Anderson’s oeuvre. It’s simply brilliant in its framing of love through children that gives paints it as innocent and pure, something that showing it with adults simply can’t do. Great review!